AKIPRESS.COM - A new study by WCS (Wildlife Conservation Society) says that breeding populations of white-naped cranes have decreased by 60 percent in Ulz River basin – an important stronghold for the species in Eastern Mongolia, reports Phys.org. Eastern Mongolia supports one of the world's most important breeding populations of the white-naped crane, a species classified by the IUCN as "vulnerable", with an estimated total population at 5,500-6,500 individuals. Among the threats to the birds are habitat loss and fire. Between 2010-2011, WCS visited a 270-kilometer section of the Ulz River basin where surveyed in 2000 and 2001. 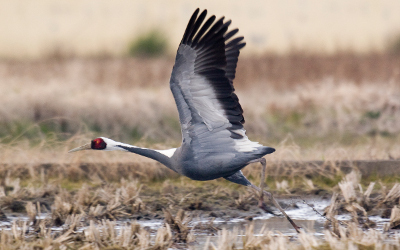 Additionally, during the same period, WCS extended the survey to more historic crane breeding sites with locations provided by from the Mongolian Academy of Sciences. Those sites are Kherlen River, Onon River catchment and the Khurkh Khuiten Ramsar site. Despite standing over 4 feet tall, the researchers found that the cranes were surprisingly difficult to observe, even in the open habitat of the Mongolian steppe. After observing 234 cranes, the scientists used occupancy modeling to estimate 867-1017 cranes inhabit the survey area, suggesting that Mongolia supports almost half of the world's breeding white-naped cranes.